Sometimes, especially depending on what online communities you’re hanging out in, It seems like everyone and their brother is doing some kind of radical diet or cleanse! Whole 30, Keto, Paleo, the list goes on. Is giving up wine, beer, and cocktails for a while you’re on a ‘cleanse’ (aka ‘crash diet’) virtuous? Yes. Ambitious? Absolutely. Necessary? We’re not so sure! If you’re planning on abstaining from alcohol to give your liver a break, or see if your energy levels improve— well, go on with your bad self! However, there are ways to make healthier choices and still enjoy an adult beverage in moderation from time to time. After all, life in the long term is all about balance. The truth is, we all know 'diets' don't work. Any pounds you drop by omitting certain foods/drinks are going to come rushing right back once your fast or cleanse is over, or you reach your goal and return back to your normal eating habits! This short-term way of thinking puts an incredible amount of stress on you- both mentally and physically. So instead of cutting things out completely, focus on simply pulling back your consumption. Whether it's limiting your intake, only drinking on weekends, or only drinking while out and not at home- whatever works for you! Moderation is the key word--- and every little bit helps. 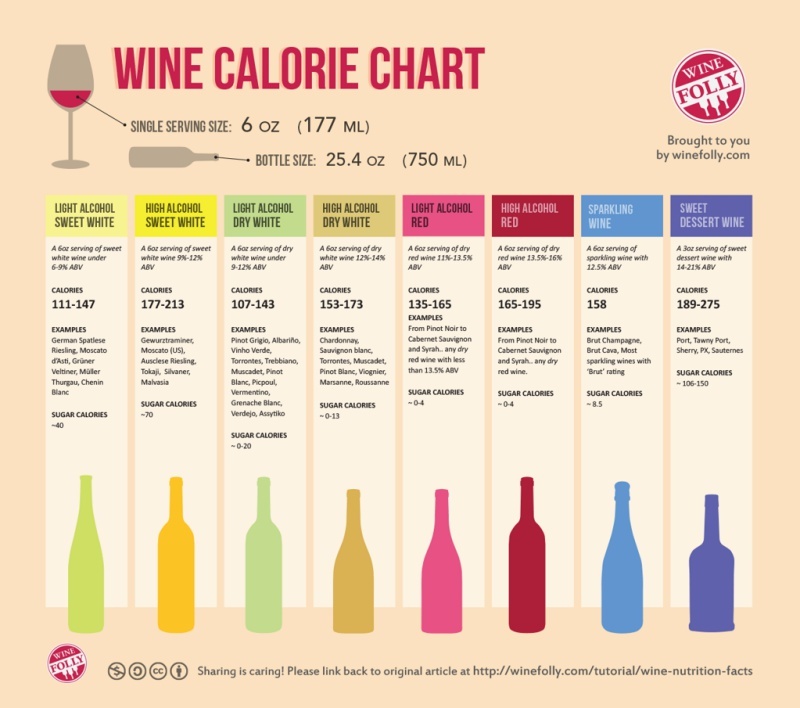 As you can see in this helpful infographic (courtesy of Wine Folly), wine is lower in calories AND carbs. Plus, beer causes your cells to swell (and who enjoys bloating? Nobody, that’s who). Also important is hydrating yourself to keep that equilibrium in your body- so a glass of water or two for each glass of wine is a good call. Not to mention wine’s other health benefits: red wine is also rich in resveratrol, antioxidants, and flavanoids--- these compounds can improve cognitive function in old age, lower your insulin production, protect against free radicals, improve heart health by scrubbing your arteries, and lower your stress level. Pass the Cabernet, please! Because alcohol packs in more calories than sugar, you want to look for wines with low alcohol content. Yes it’s counter-intuitive--- but a sweeter wine with a lower alcohol percentage will still be lower in calories that a higher alcohol wine. Look for wines in the 10%-12% ABV range. Every wine label in the US is required to state the alcohol percentage, so it should be easy to make smart choices here (the % number may be in teeny tiny print, but it’s there!) A good Cru Beajolais or an old-world Pinot Noir should fit the bill for reds; for whites I love dry Riesling. Step away from the Prosecco: sorry to inform you, but sparkling wines are by far the highest in sugar, due to the dosage that’s added to the wine. Check out our Sparkling Wine Primer here for more info. And that fabulous fizz, while festive, could cause also cause bloating. Still wines are a smarter choice. If you've been giving your liver a workout lately- now it’s time to take care of the rest of that body! Aerobic exercise erases any over-consumption guilt, while raising your heart rate revs your metabolism for several hours. Working out will make you feel amazing and allow wine to remain part of a balanced and healthy lifestyle… plus knowing there’s a glass of wine waiting is excellent motivation: put in a good 30 minute session on the elliptical, earn an extra glass of Vouvray. You might just start to look forward to the gym!